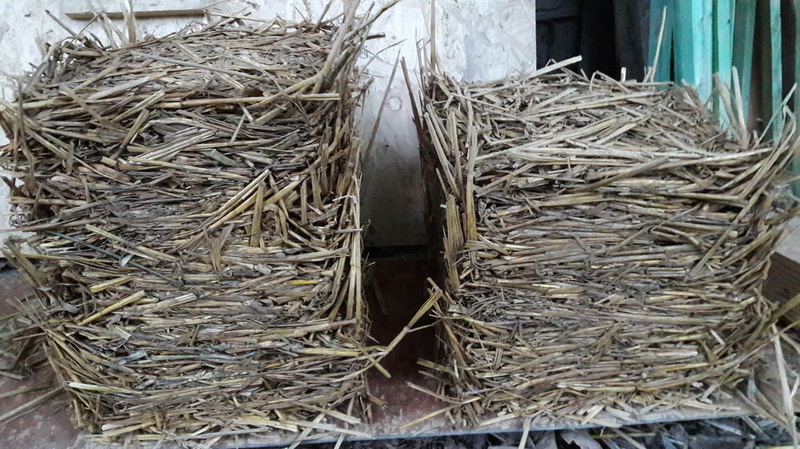 Light Straw Clay allows you to infill a wall structure with a high straw-content mixture. This will provide an excellent insulation. The clay used in the mixture will absorp humidity inside the wall adding to the entire insulation value. The clay will also provide some thermal inertia. This method is also really cheap! 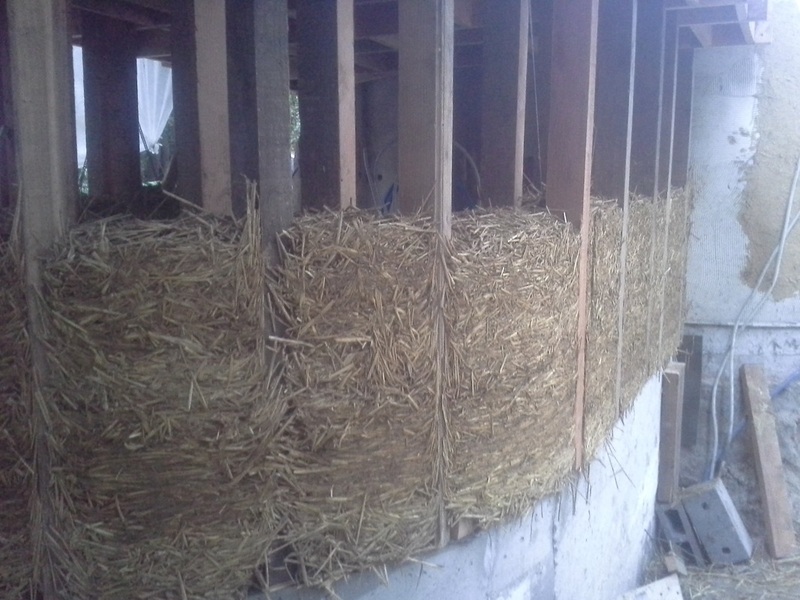 Our wall of about 6 cubic meter took us only about 50 euro to fill in with light straw clay! Frst you'll need to know the amount of clay inside the loam soil you are using. There are several ways to check this, as explained on our page about Loam . However none of these methods are thruly precise: in our case we couldn't even see a difference between clay, sand and silt in the bottle test (see Loam). The most certain way would be to bring your loam soil to a labaratorium and let it checked. We want to create a mix with a precise amount of clay that will coat the straw and eventually 'glue' the strawfibres together. Using this chart we can figure out how much volumes (in the chart expressed in gallons) of subsoil will go into 40 volumes of the mix. subsoil: the loam you dig right out of the earth (clay + sand + silt). 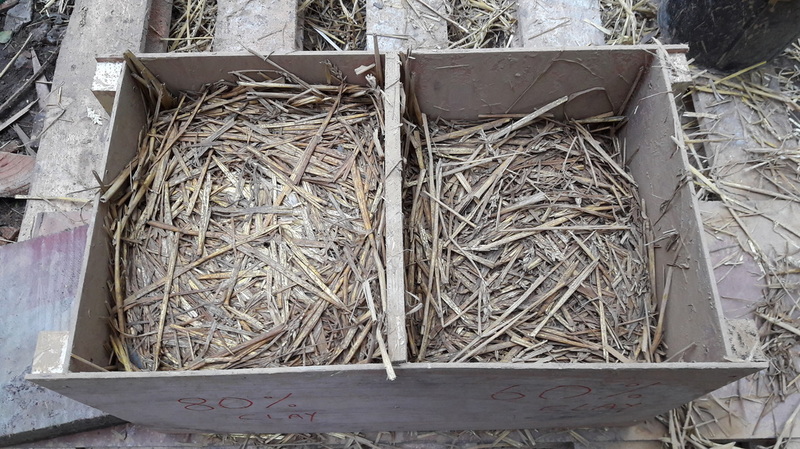 ​We could right away see that the assumption of 40% clay content gave us a mix that is way to thick to coat the straw: our goal is to have a very light watery mix. This left us with the 60% and 80% assumption. So, we just made two samples with them. Both samples were okay, we could however see that the 80% (left sample) assumption gave us a sample that was less compacted, but still structural enough to use. The 60% assumption (right sample) gave us a sample that was well ridgid, but maybe a little too high on clay content. So we decided to go for an assumption close to the 60%, because this gave us more confident on the final structure of the wall (more ridgid, little less insulative). Now we "know" we have about 60% clay in our subsoil. If you would have less than 40% the subsoil would not be suitable to use for light straw clay. According to the table above this means we need 25 volumes of subsoil in our final mix of 40 volumes. So we took a big tub and started to fill the tub with buckets of clear water untill we reached a decent level. We counted 5 buckets untill this level. So 5 buckets is 40 volumes. We took a stick and marked the level on the stick for later reference. When 5 buckets is 40 volumes and we need 25 volumes, we calculated we need 3.125 volumes of subsoil (5 buckets x 25 volumes / 40 volumes). 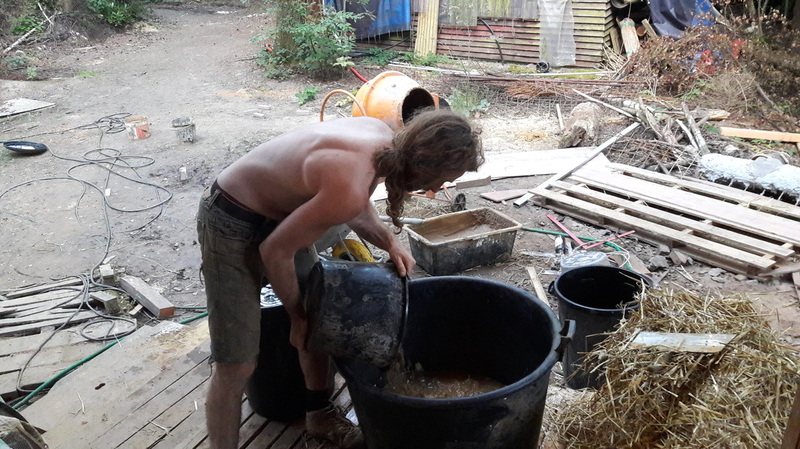 So we emptied the big tub completely and filled it with about 3 buckets of our subsoil. Than we added water untill we reached the same level we had before (when we poured in 5 buckets of water). This way we have the perfect amount of subsoil in the water! After mixing we sifted the mix through a piece of textile to get the bigger loam parts out. We used the last mixing method as we didn't have tools to do the first and the second would take a lot more time. Form a tick sigar with the clay straw mix and twist it firmly. When the clay slib poures out, it's too wet. When you don't see any water it's too die. The perfect amount is when the water shows on the surface of the sigar. Applying the clay straw mix is really easy... Just drop a descent amount in a mould and use a stick to compact it... there you go... all done! Allready after three hours you can take the molds off. You shouldn't leave them on much longer, because the high water content will make the straw ferment and/or rott. 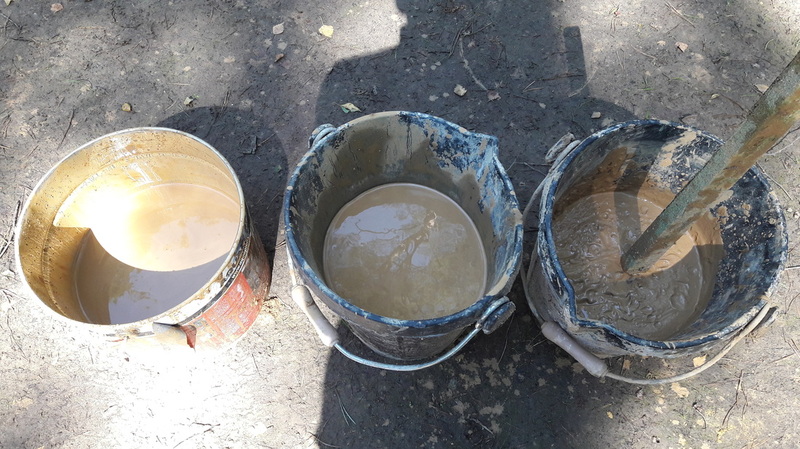 ​The result is amazingly strong taking the few clay that went into the mix! !